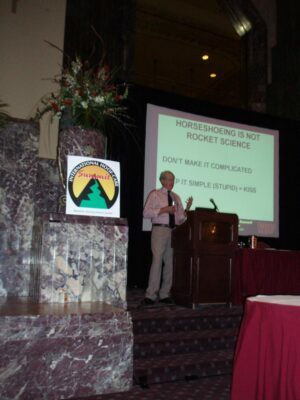 After putting my proverbial toe into the water by checking out farriery in the United States last year, I was invited by the American Farriers Industry Association to address the Third Annual International Hoof Care Summit in Cincinnati in February 2006. Not only that, but I was invited to give both the opening and the closing lectures. I wondered if maybe I had put my whole foot in my mouth instead of in the water – was I being honoured by this invitation or perhaps being lined up for the firing squad? The two topics I selected were my usual bandwagons – I would open with ‘Back to Basics’ and close with ‘What has happened to the K.I.S.S. Principle’. Everyone who has ever worked with me or attended one of my courses could probably just about recite by heart what I would say. I did research some introductory comparison data for my power point presentation – Australia is similar in land area to America, however Australia has 20 million people compared to Americas 300 million. Los Angeles alone has 20 million people! Australia has 1.5 million horses compared to America’s eight million horses. But that does give Australia a ratio of one horse per 13 people compared to America’s ratio of one in 33. We had one day in LA in beautiful 25 degree weather. Then we flew on to Cincinnati where it was four degrees. Farriers Conventions in the USA are timed for the winter months when work is slow, and good accommodation packages are available. Our room was on the 26th floor of the Hilton Cincinnati Netherland Plaza, a state of the art 28 floor Art Deco Hotel built in 1930 and renovated to all its former glory, and we paid an amazingly cheap $US89 per night for this privilege. The Convention Centre is two blocks down the road from the hotel and as first speaker, I didn’t have any time to think about getting nervous. Around 700 farriers registered for this four day Hoof Care Summit, illustrating an amazing enthusiasm and desire to learn. Start with the biggest foot (the dominant hoof). Clean out loose and dead material. Remove only dead, flaky sole and leave the sole concave. Expose the active tip of the frog. Place my HOOF-LINE marker on this active tip. Compare the measurement of the hoof from active tip to the toe and from active tip to an imaginary line drawn 6mm above the junctions of the heel buttresses – if the front is longer than the back then leave the heels untouched. Trim the front only, (assuming that is the longer half), ensuring that the hoof capsule is an even thickness all the way around. Uneven thickness is caused by flares. Rasp flares away, copying the shape of the ideal coronary band. The measurement in front will then be correct, as the hoof has been correctly prepared. To achieve equal measurement in the back half, to a straight line across the buttress of the heel, the heel may be left alone or lowered accordingly. Check the medial/lateral balance in the same way. When this balanced measurement is achieved, the front of the hoof wall is parallel with the pastern angle, the hoof shape is a mirror image of the coronary band, there are no flares in the hoof wall and the hoof is stress free. (The foot will also stand squarely). A correctly balanced hoof should be the end result of every single trim. But why isn’t it? Why are there so many hoof problems? In Australia, horses invariably have long toes and low heels; from what I have seen in America, there are more short toes and high heels. Neither is correct – these are farrier problems and can be eliminated simply by correctly balancing the hoof. All of which can be eliminated by correctly balancing the hoof. After the lecture and associated question time had finished, I was still answering questions outside the hall two hours later. I spent every spare minute over the next four days talking – in the corridors, the elevators, the dining rooms, the bar and on the street. The only meals I managed to eat were delivered by room service. It was exhilarating to arouse so much attention and to talk to so many farriers about their problems. The younger farriers in particular wanted specific information – so much is said about balancing the hoof, but there is no specific documentation about achieving it. It gives me such pleasure to be able to give them the information they need. The four days was a total learning platform of roundtable discussion groups and lectures, with some trade show slots. I talked with many of the well known names in farriery – Dr Stephen O’Grady, Gene Ovnicek and Mike Wildenstein. I also attended their lectures as well as those of Dr Ric Redden, Dr Susan Kempson, Dr Scott Morrison and Dr Bob Bowker, and appreciated how privileged I was to address this convention. I attended a breakfast for members of the World Farriers Association. The Japanese Farriers Association had its own translator, and I was able to explain my techniques for hoof balance to them. Members from Canada, UK, Switzerland and Denmark were just some of the countries represented. My second presentation ‘as the cleanup batter’ (to quote the Hoof Care Summit literature) was held in the Hotel in the extravagantly luxurious two storey high Hall of Mirrors. I followed on from my first presentation by reinforcing the need to keep the principles of trimming and shoeing simple, and not to get lost in the flood of new products and techniques aimed more at making money than at truly helping the horse. After Cincinnati I ran a course (clinics as they call them) in Richmond, Virginia and then more clinics in California. I was even invited to address a select gathering at the prestigious Santa Anita Racetrack in Los Angeles (as seen in the movie ‘Sea Biscuit’). 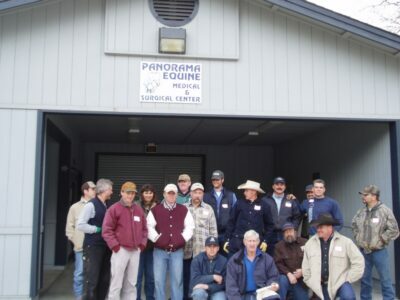 I ran a course at the notable Panorama Equine Centre in Redding, Northern California with Dr Wally Libermann, and on the way back to Los Angeles I had a productive meeting with researcher Michael Savoldi where we compared our techniques for achieving hoof balance. Then I flew on to Omaha (even colder than Cincinnati) where I attended a second Farriers’ Convention. Emphasis here was more oriented to shoe making (forging), shoeing competition speeds and skills with Wetlabs (workshops) offering the opportunity to work alongside premier farriers. Flying out of snowy Omaha, I flew back to Los Angeles for a final clinic in Orange County where a breeder with 20 large carriage horses had extreme ongoing lameness issues over the previous five years. I worked with his two farriers for three days and achieved soundness in all 20 horses. It was 25 degrees when I left Los Angeles and flew home to Adelaide to 35 degrees and an appointment book of full of my very patient clients before preparing to head to outback South Western Queensland to teach courses in heavens knows what temperature.